While it's only been a couple months since David Chang opened Momofuku Nishi and not even a year since he first blessed your lunch break with Fuku fried chicken sandwiches, the chef's culinary empire is about to get even bigger this spring with the launch of a new, all-delivery Momofuku. In an extensive profile published on Tuesday by Fast Company, Chang revealed his top-secret plans for the new food delivery service/restaurant concept, dubbed Ando -- a name also inspired by instant-ramen creator, Momofuku Ando. The restaurant, based out of a subterranean kitchen Chang runs with Chef J.J. Basil, will offer a variety of foods from tofu bowls to an enormous chicken cheesesteak sandwich made with American cheese sauce Chang claims is "maybe the most dangerous thing I’ve eaten all year." Milk Bar's Christina Tosi is also developing three new cookies for Ando, and there's even a possibility it will offer a "KFC-style" fried chicken bucket as a secret menu item, per the report. 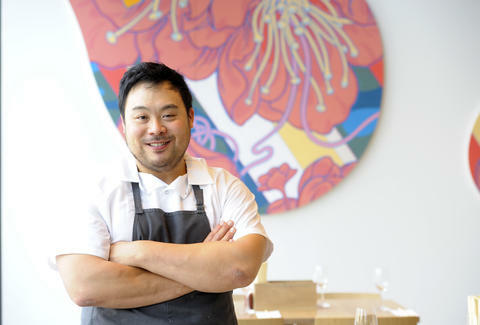 Although Ando's Momofuku eating experience won't involve going to a traditional brick-and-mortar restaurant, Chang said he considers it as no different than any of his other Momofuku restaurants. He also hopes to package the meals in old school Chinese food delivery containers that'll come stamped with the Momofuku logo's peach. As for logistics, Chang has teamed up with Expa, a San Francisco-based startup lab, as a joint venture. Expa is designing Ando's mobile ordering app, and UberRush will handle the food deliveries. Ando could launch as soon as later this spring, but only in Manhattan at first. As an Expa official explained, they all want to get Ando right and "make this feel great -- like Momofuku at home" before expanding to other areas, according to Fast Company. But Ando isn't all Chang's working on (big surprise). As Eater points out, Chang also shared plans to open a larger Fuku outpost that could potentially serve fish and vegetarian options in addition to its signature spicy chicken sandwich. He and Tosi also want to double the number of Milk Bar locations by the end of this year. In other words, you might want to get ready for Momofuku to take over the world. It's only a matter of time now. Check out Fast Company's full profile with Chang, right here. Tony Merevick is Cities News Editor at Thrillist and votes for buckets of fried chicken. Send news tips to news@thrillist.com and follow him on Twitter @tonymerevick.